19 years ago the founder of Team Kilimanjaro was in a similar position to most of the people who find this site and are committed to undertaking the challenge of climbing Kilimanjaro: aware that there are so many options – six routes and many variations on these routes, some 494 companies that can organise your climb, considerations of weather, diet, equipment choice, support level, safety, when to climb, where to stay before and after the climb, and so on. We are therefore very sympathetic to those who begin their research at the very outset and are struggling to cut through the swathes of options, refine their choices, and work out how to go ahead with securing their Kilimanjaro climb and peripheral arrangements. In the hope of adequately addressing these quandaries, we would like to offer the following flowchart that we trust will ease the process of making all the necessary decisions. Local Companies. Companies whose owners usually have little if any interest in the actual activity of climbing the mountain, but realise that arranging climbs is a good, honest way of earning a living, and a useful way of exploiting their extended family connections and providing an income for their hardworking young brothers, nephews and cousins. This type probably encompasses the vast majority of registered companies. Entrepreneurs. Companies whose owners are essentially travelling entrepreneurs; who once engaged another climb operator for their own ascent, befriended a local guide, and proposed that he / she and this local guide start their own operation. In this case, the foreign co-owner likely simply enjoyed their own climb and looks forward to the possibility of helping other fellow enthusiasts plan and execute their own climbs. Agents / Marketers. Typically, these are run by people who once contracted another operator for their own expedition (if indeed they ever visited the mountain at all) – whether a local operator, or even another agent – and who has returned home, created a website, and proposed to the local operator that if given preferential agents rates, they may use their marketing prowess to send many clients to the local operation; making a commission on each sale. Mountaineers. Companies whose owners are mountaineers and irrepressible enthusiasts about climbing mountains and planning expeditions. There's only a small handful of these – with recent closures, probably now fewer than five companies operating in Tanzania. Typically, Mountaineer-type companies operate within the highest budget bracket and consequently have relatively few expeditions throughout the year to choose from. The obvious disadvantage of this fact is that since they are not able to support their mountain staff year round, but contract them only spasmodically, their staff are required to work for other companies also, and may become confused about their operational ethos and values, and pick up bad or unsafe operational habits from some of the local companies they work with, while waiting for a better-paid expedition with the Mountaineer-type company. Something unique about Team Kilimanjaro is that while we are run by people whose passion is mountains, because a) we want as many people to discover and enjoy Kilimanjaro as possible, and b) we want the majority of our staff to work only for us and not have to find work with other companies, we have therefore always worked to keep our profit margin as low as possible. We want to ensure our staff are kept busy with us all year round, and that they enjoy the privilege of serving Kilimanjaro climbers as often as possible. Youngsters, volunteers and students on whose successful climb little depends, and who approach the challenge simply as a bit of fun – not really minding whether or not they actually summit, will tend to contact a local company and aim to negotiate the lowest costs possible. Typically, with a budget company the decision to summit will not be pre-determined and rather more of a case of playing it by ear, with guides often hoping that their charges will be content with stopping at Stella or Gilman’s Point rather than pressing all the way to the summit. People in their more senior years who are used to doing things the way they used to be done before the Internet when most people booked holidays through travel agents, and who therefore want to have their flights booked for them, will generally opt to book with agents whose offices are based in their own country of residence. People booking with agents will not really mind that the agent simply subcontracts a local company and has no direct control over on-the-ground arrangements, or that all communications have to be distilled and relayed to the local operator, and that customisation of the trek and the necessary adaptation to diverse abilities within the group that is required to ensure everyone has the best chance of summitting, is not a realistic possibility when booking through an agent. Those who are serious about summiting, and capable of envisaging from the comfort of their home or office, the realities of potential complications that may arise when operating at high altitude and in a wilderness environment, will generally want to prioritise booking with a company run by experienced mountaineers that is going to put them into the hands of a highly competent and professionally trained team; knowing that such operations build their standard operating procedures systematically and methodically, on the back of extensive experience in hostile environments where much can potentially go wrong. 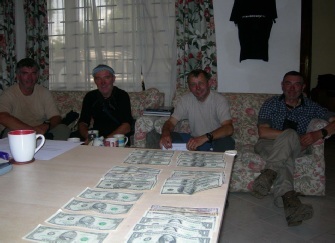 Such would-be Kilimanjaro climbers are also reassured by the fact of Mountaineering-type companies having unique and carefully conceived strategies that are necessarily absent in operations with a less intense pre-occupation with the field, and which best ensure comfort, safety and success at altitude. 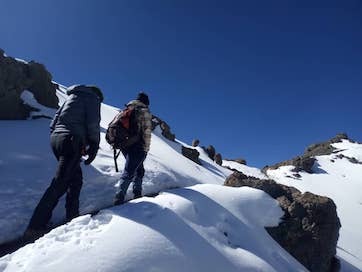 In short, while a TK climb is not necessarily the best choice for everyone, for trekkers who are serious about summitting and getting the most out of the experience, and who are willing to allow our professional and compassionate guides to do their jobs without hindrance, of giving you the best possible chance of achieving your goal on Kilimanjaro – Team Kilimanjaro is for you. 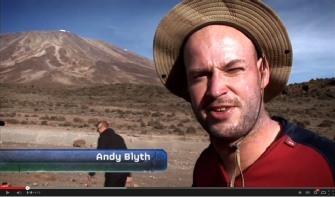 You can request to meet your guide in advance, prior to paying for your climb. For those who have already made the decision to climb with a budget Kilimanjaro operator and are concerned about the obvious fact that the best guides are generally unwilling to receive the lowest wages and therefore not likely to work for budget companies, this fact is quite reassuring and is perhaps attractive to students with a lot of time on their hands, who are willing to enjoy the hospitality of several operators in their Arusha offices over a period of two or three days while they wait for the right people to become available to meet with. An obvious drawback, however, is the fact that many local Arushans are very courteous and charming when meeting prospective clients, but that a positive meeting or ‘good feeling’ about someone really offers no logical endorsement of their competence, or ability to cope with challenging circumstances should matters take an unwelcome turn at high altitude. You can usually negotiate a hard bargain and get a very cheap price for your climb. For those who simply want to visit the mountain and are not overly concerned about whether or not their guide can be persuaded to go with them all the way to the summit, the fact of this being the cheapest method of climbing Kilimanjaro makes this an attractive option. There are several young guides who have essentially started their own operations, and who pay other local companies to use their stationery in order to pass registration at the gate. These guides can often be persuaded to climb for just a few hundred dollars more than the USD 977 cost of the park fees for a seven day climb, particularly if led to believe that a very large tip will compensate their brothers and cousins – who will accompany as porters – for not receiving a salary. Using this method, if the traveller has a rugged constitution and irrepressible appetite, it is possible heavily to bias the diet towards local foods such as maize flower mixed with water, to use local buses, and to borrow or hire old tents and equipment from friends or failing companies. Climbers may obtain valuable advice on training and preparation from their operator. While some fortunate people summit with no training, it is certainly an advantage, and we appreciate the opportunity to offer advice on training specificity. Additionally, substantial cost savings may be made by hiring some of the equipment that you do not necessarily need to own. It is helpful to discuss with your operator what to obtain and what to hire and how to test and prepare your equipment to ensure that it serves you well on your climb. Making paying for your climb as straightforward as possible. Perhaps a majority of travellers are surprised when arriving into Arusha they discover how primitive and uncompetitive local banking services still are. Indeed, in several respects service has actually declined over the past 15 years. Many imagine they will be able to obtain US Dollars without impediment. This is sadly far from the case, and if planning to draw local funds from an ATM – and content to pay two Forex conversion fees – you should be aware that the best machines in Arusha will only release the equivalent of around USD 250 per transaction (if they’re not empty, as they often are). Booking ahead and paying for your climb by wire transfer or credit / debit card is generally therefore the preferred option. Ensuring you get the best guide for your climb. If turning up and booking an operator at short notice, you’re unlikely to be allocated a very good guide. This is because – unless the company has just the day before been notified of a cancellation, or you’re climbing in April or November – if the guide is any good, he’ll almost certainly already be engaged on another climb. The best guides get recruited by the best company, and climbers generally engage these services in advance. Team Kilimanjaro aspires to offer some of the highest quality climbs, staffed by some of the best trained and most motivated mountain professionals in the industry. We aim to provide the best foods and provisions and to use some of the best mountain equipment obtainable. These measures involve higher costs than are involved with budget-oriented climbs. For those who are required to prioritise budgeting and who therefore need to look for a relatively cheap Kilimanjaro climb, we are very pleased to recommend our sister operations, Kilimanjaro Alpine Service and Team Maasai. When first our founder climbed Kili on 27th March 2000 at the age of 21, he had arrived into Tanzania with only very limited funds and had spent the last few years doing gruelling self-supported expeditions throughout Europe and East Africa whenever time and funds permitted. The concept of receiving the usual level of support thus seemed very alien to him. His first ascent of Kilimanjaro was therefore completed in just one day (12 hours 33 minutes to the summit on the Marangu Route) with only one guide and no porters, for a cost of only 45 US Dollars. But much has changed since then! 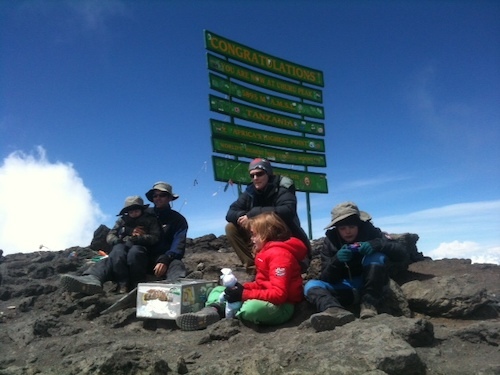 Twelve years later he summitted the mountain with his entire family which included three children aged 5, 7 and 9 (and a special waiver obtained from the park authorities as all three children were under the "legal" age to summit; and yes - Team Kilimanjaro is the only company that our founders would have entrusted such young children to), using one of the highest ratios of support staff to climbers that we have ever operated. TK are therefore very much aware that while some super-fit young climbers want virtually no support, others request to pay supplements to sleep in tents that they can stand up in, have ensuite facilities, small bath tubs, and quite an elaborate support structure. Far from resisting any departure from established norms or working to a one-size-fits-all policy, we are always excited by the prospect of customising our expeditions to suit specific demands. That said, aware of the diversity of expectations across a wide range of adventurers, we believe that we already have by far the most comprehensive range of support options available, ranging from Superlite, Lite, and Advantage, to our Excel and Hemingway Series, as well as customised climbs for groups with very rare demands and which require a larger support structure than Advantage / Excel. While possible to climb with us on any day of the year, climbers should be aware of two rainy seasons spanning April to May and November to early December. TK are able to accommodate climb requests on any day of the year, with the only limitation being accommodation before and after the climb, so please don’t feel that you need to run your dates by us before being in a position to book flights and make firm plans. If not particularly partial to a specific hotel or accommodation standard, we will book you at one of the three standard range hotels that we offer. Those on honeymoon or wanting an upgrade to something more luxurious should use our ‘hotels’ link. Whether staying at a standard grade hotel or otherwise, we ask that you please aim to contact us as early as possible, as soon as you know your dates, so as to ensure that we can secure availability. Most visitors who are making the effort to come all the way to East Africa – unless you already live here – will want to see a little more of Africa, provided they can obtain long enough leave of absence from their usual duties. Most typically, climbers will choose to go on safari, to Zanzibar - for some well deserved R&R, or to both locations. We are able to assist you with any such plans in Tanzania. Thinking about adding a wildlife safari or trip to Zanzibar? We recommend that flights are booked as soon as you know how many days you are going to be able to spend in Tanzania, and even before you have necessarily ironed out the details of your climb, safari or Zanzibar itineraries - if you decide to include these elements. All climbers are required to climb via one of only six officially sanctioned routes. These are, from west to east, Shira, Lemosho, Machame, Umbwe, Marangu, and Rongai. The western routes, (Shira, Lemosho, Machame and Umbwe), are required by KINAPA to descend via the Mweka Route, a descent-only route, while the eastern routes, (Marangu and Rongai), must descend via the Marangu Route. Climbers are required - via their tour operator - to inform the park authorities which route they are electing to use, and are not permitted to switch routes while on the mountain. Although there are only six trekking ‘routes’, that is only to say that there are six different locations from which it is permitted to begin an ascent. Provided that the correct descent route is used, there is actually a very high number of possible route permutations that can be followed, particularly on longer treks. Rongai, for example, has at least 11 variations along which we could configure a climb, if asked to. But although there is a great deal of route choice available, very few of the available options can be argued to be intelligent, or in any way optimal. It should be remembered that when the original standard routes were originally built, there was virtually no input from mountaineers, and route selection was simply a matter of how obstacles of topography and vegetation might most simply be overcome, and usually by people who were already well acclimatised and possessed no knowledge or scientific understanding of the process of acclimatising to high altitude. The consequence of such limited route selection criteria means that the standard route options that have evolved are generally very poor in mountaineering terms and will result in unnecessary exposure to headaches and nausea, and reduced prospects for summit success. In terms of general year-round usage, since none of the original routes was deemed by TK to be acceptable in terms of incorporating sufficient exploitable topography with respect to the principles of safe and thorough acclimatisation; minimising exposure to crowds, and enhancing prospects for wildlife confrontation, we were constrained to develop entirely new route variants, that until very recently, were used only by our climb teams. These routes still remain almost exclusive to us, with only a very small handful of fellow operators having succeeded in following suit. By far our most successful route to date has been TK Rongai, which we designed in January 2007, with around 60% of our climbers nowadays choosing to use that route. Our expedition coordinators will be very happy to assist with your route selection, however we advise climbers to begin with quite a comprehensive assessment of their options, by perusing our page on ‘how to choose your Kilimanjaro route’. Choosing your climb route is potentially the most involved decision you will need to make throughout the whole process, so please don’t wait until you have made this selection before going firm on your dates. Indeed, you may deliberate on route selection pretty much up to the last minute before you pay for your climb, as – other than the Marangu Route – route bookings do not need to be secured in advance. Ordinarily, we don't recommend Rongai, as it has a similarly poor lack of exploitable topography to the Marangu Route and therefore both a high failure rate and high incidence of severe AMS. However, TK operate Rongai completely differently to every other climb company. Our own version of Rongai is so successful that it was not until our 13th expedition on our then new TK Rongai Route, before a single climber failed to reach the summit. Those specifically wanting to see the west side of the mountain and who hope to see barely a soul along the whole route, will generally opt for our TK Lemosho Route – our unique variation on the Lemosho Route that passes round the north side of Kibo, and which has in recent years become by far Team Kilimanjaro's most popular route. TK Lemosho - our most popular route and yet the least crowded route on Kilimanjaro! Those who enjoy the prospect of crowds and who hope to meet as many other people as possible will generally opt for the Machame Route. And those for whom climbing Kilimanjaro per se is not already exciting and adventurous enough, will generally opt to climb the Western Breach with us. We recommend training for Kilimanjaro for two reasons: to increase the likelihood that you will summit, and – if you’re already confident that you’ll summit anyway, whether you train or not – to increase your enjoyment of the climb, by ensuring that you suffer less. Please look in more detail at our training advice using the training link at right. It is generally recommended that this is obtained in advance. If you’re of Middle-Easters origin or appearance or have a name of Muslim or Arabic origin, it is absolutely essential that you obtain your visa in advance as we have known of several cases of Middle-Eastern nationals being turned away from Immigration and being unable to enter the country because they did not obtain their visa in advance. We strongly recommend that you discuss equipment purchases with the coordinator that will be assisting you with your climb, so as to ensure that you do not purchase anything unnecessary or unnecessarily expensive. In the meantime, please peruse our suggested packing list. That’s it! Our coordinators enjoy nothing better than guiding you through this whole process and are waiting and at your service to deal with even the very smallest concerns you may have. So, please don’t hesitate; we’re always absolutely delighted to hear from new climbers whether you’ve been thinking about climbing for months, or whether the thought has just occurred to you today and you want to explore its viability.